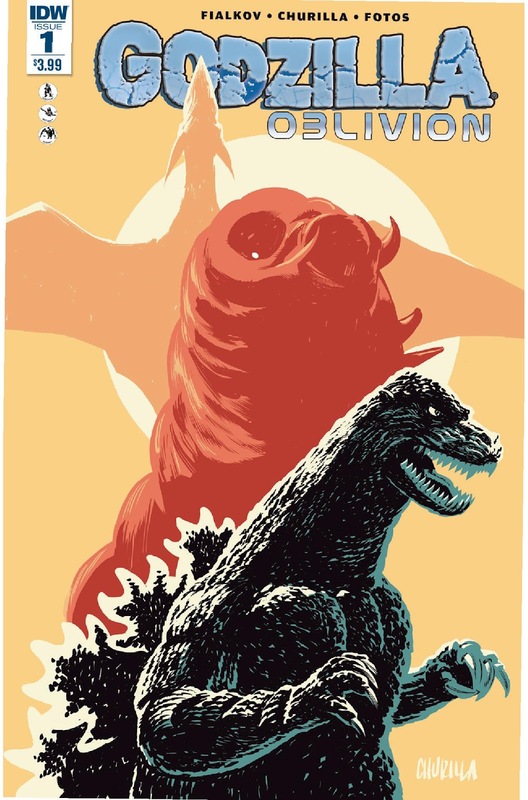 The Fellowship was fortunate enough to obtain a copy of GODZILLA: OBLIVION #1 from IDW Publishing. The story is by Joshua Fialkov, with art by Brian Churilla, colors by Jay Fotos, and lettering/creative consulting by Chris Mowry. Doctor Eli Talbert has created a device that opens portals to another universe. Unfortunately, Miss Yamada (Talbert’s financer) wants to send a team through before testing can be completed. BAD IDEA. The team is sent to an Earth ruled by gigantic monsters. They are controlled by Godzilla…for a price. What has happened here? Can the team get back to their world? And if so, what can they do to prevent their Earth to suffer the same fate? I’ve enjoyed Joshua Fialkov’s work ever since I first read THE LAST OF THE GREATS, so I was hyped for this book. While not the most original of plots, it's promises to be a fun ride. And it’s Godzilla, so I’m not going anywhere. First noticed Brian Churilla’s work on BIG TROUBLE in LITTLE CHINA, and it appears that he’s having fun with this one. Solid color job by Jay Fotos as always. Check this book out. GODZILLA: OBLIVION #1 is in stores now, or available for ordering at www.idwpublishing.com.